Iran, a country in Western Asia bordered by Armenia, Azerbaijan, Turkmenistan, Afghanistan, Pakistan, Iraq, Turkey, Caspian Sea, and the Persian Gulf has a total land area of 636,372 square miles and a population of about 77 million. Though the country is known as Iran in the political world, culturally and historically it is referred to as Persia. Iran is home to a very diverse fauna including the critically endangered Asiatic cheetah. Iranians are skilled in architecture, painting, carpet weaving, pottery, calligraphy, and metalworking. They also pioneered the use of mathematics, geometry and astronomy in architecture. The best time to visit Iran is March through May and September through November. Many Iranian locations are featured in UNESCO’s World Heritage Sites. Its mountainous terrain makes it popular among hikers, rock climbers and mountain climbers. 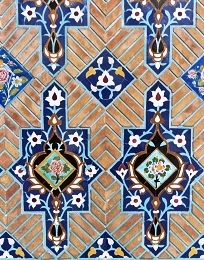 The major attractions of the place are Esfahan, Central Bank in Tehran for the precious stones display, and Palace of Roses for various artifacts which includes the Peacock Throne. Iranian cuisine is generally a non-spicy blend of rice, vegetables, meat, and fruits and nuts accompanied by yogurt and flavored by saffron, coconut, onion and garlic. Lonely Planet Iran Country Guide 978-1741042931 $19 A traveler’s introduction followed by sections on Tehran, Western Iran, Central Iran, Persian Gulf, Southeastern Iran, and Northeastern Iran. A Time To Betray: An Astonishing Double Life of a CIA Agent Inside the Revolutionary Guards of Iran 978-1439189030 $18 The National Best Books 2010 Award Winner! The true story of the author told twenty years later. Iran Travel Map by International Travel Maps 978-1553412502 $9 1:1,800,000 scale. Inset map of Central Tehran at 1:50,000 scale. The first stamps of Iran were released in 1870 in the Coat of Arms theme. The set (Scott #1 to #4) is rare and valuable cataloging for around the $500 range. A slightly modified design on the Coat of Arms theme debut in 1876 and that set (Scott #11 to #14) also catalog in the same range. A variety of the same set released in 1878 is the most valuable set among Iranian issues. The 1t bronze (Scott #40) from the set catalogs for around $45K mint. Issues depicting Nasser-ed din Shah Qajar along with a Sun design formed the stamp issues of Iran until 1882. Those sets (Scott #43 to #46, #47 to #49, and #50 to #52) are also very valuable cataloging in the $500 to $4K range. The Sun symbol along with the Lion is associated with Iranian royalty. Iranian (Persian) kings were referred to as the Sun of the East. Nasser al-Din Shah Qajar was the King and Shah of Persia from 1848 to 1896. His reign of 50 years came to an end when he was assassinated while visiting the shrine of Shah-Abdol-Azim. His governing style was dictatorial and he persecuted Babis and Bahais. That legacy of persecution of Bahais in Iran continues to this day. Iran released a set of seven stamps between 1882 and 1884 depicting the Sun and Shah Nasr-ed Din. The set (Scott #53 to #59) catalogs for around $800 mint and around $120 used. Issues showing the Shah Nasr-ed Din along with the Lion and Sun symbols were the primary stamp issues of Iran till the turn of the century. Most of those sets are valued upwards of $100. One exception was the released of a long set of sixteen stamps in 1898 in the Mozaffar ad-Din Shah Qajar theme. The set (Scott #104 to #119) catalogs for around $130 mint and around half that for used. Mozaffar ad-Din was a largely ineffectual leader who was known for his extravagant lifestyle. Iran released a set of thirteen stamp between 1903 and 1904 showing the Arms of Persia and Shah Mozaffar ad-Din. The set (Scott #351 to #363) is sought after and catalogs for around $600 mint and $130 used. A set of nine stamps released on February 21, 1935 to mark the tenth anniversary of the reign of Riza Shah Pahlavi. The set (Scott #786 to #794) catalogs for around $110 mint and $40 used. The designs show Allegory of Justice, Allegory of Education, Ruins of Persepolis, Tehran Airport, sanatorium at Sakhtessar, cement factory at Chah-Abdul-Azim, Gunboat Palang, Railway Bridge over Karun River, and Post Office and Customs Building of Tehran. Reza Shah came to power in 1925 by overthrowing Ahmad Shah, the last Shah of the Qajar Dynasty. His authoritarian government was characterized by several socio-economic reforms aimed at modernizing the economy. He was forced to abdicate his throne in favor of his son following a request by the Allied Powers during World War II in August 1941 – the Allied powers invaded Iran mainly due to the refusal of the Shah to allow Iranian territory to be used to transport supplies, a critical element of Russia’s war effort against Germany. A long set of thirty four stamps released between 1942 and 1946 depicting Mohammad Reza Shah Pahlavi and certain prominent buildings. The set (Scott #876 to #909) has many high-values and is sought after cataloging for around $3500 mint and around $270 used. The designs show Bridge over Karun River, Veresk Bridge in North Iran, Granary at Ahwaz, Train and Bridge, Views of the Museum, Ministry of Justice, and School Building. Mohammad Shah Pahlavi was the Emperor of Iran from 1941 to 1979. He was overthrown by the Iranian revolution which resulted in the rise of the Islamic Republic of Iran under Ayatollah Ruhollah Khomeini. A set of nine stamps released in 1979 following the Revolution with the Shah’s image stroked out. The set (Scott #2008 to #2018) catalogs for around $90 MNH and $30 used. The original design has an overprint that states ‘Islamic Revolution’ in Persian. The designs show Warriors on Horseback at Naqsh-e Rustam and Chehel Sotoun Palace at Isfahan. Naqsh-e Rustam is an archaeological site located near Persepolis which dates back to 1000 BC. A set of ten stamps released between 1983 and 1984 showing religious and political figures. The set (Scott #2128 to #2137) catalogs for around $13 MNH and $5 used. The designs show Sheikh Mohammad Khiabani, Mirza Kuchik Khan, Seyd Majtaba Navab Safavi, Seyd Jamal-ed-Din Assadabadi, Seyd Hassan Modaress, Sheikh Fazel Assad Nouri, Mirza Mohammad Hossein Naiyni, Sheikh Mohammad Hossein Kashef, Seyd Hassan Shirazi, and Mirza Reza Kermani. The first coins of Iran (Persia at the time) dates back to around 546 BC, when Cyrus the Great captured Sardis in Lydia were the first coins of the world was produced. Gold coins were introduced under Darius I around 521 BC. Iranian coin dating of the modern era is unique in that the Moslem Lunar Calendar was used until March 21, 1925 when it was switched to the solar year. A monarchial calendar was introduced briefly for two years in 1976 as well. Copper Hammered Coins were prevalent in the 19th century with many regional issues from different mints. The first gold coins of the modern era were Pahlavis (0.1177 troy ounce) issued in 1931 showing Uniformed Bust in Obverse and Radiant Lion Holding Sword with Crowned Wreath in Reverse. Many gold and silver commemorative proofs have been issued by Iran since the 1970s. Ancient Coins $15 and up Silver Shahis from the 16th century, Amir Wali Crude Coinage, etc starts around $15. Muhammed Shah Qajar Coins start around $50. Gold Dinars, 7th Century Iran Governors Silver Coins, etc go well into the 100s and 1000s. Other Coins $1 and up Common UNCs starts around $1. Early Silver Coins Starts around $10. High Values from the early 20th century in XF starts around $50. Gold Proofs and other Rare Commemorative Silver Proofs go well into the 100s. Gold Coins go well into the 1000s. Paper Money $1 and up Common UNC banknotes starts around $1. VF Banknotes from the 1950s starts around $10. Bundles, Rare Dates, Error Varieties, and Low Numbers go well into the 100s. Mini carpets and other weaved items, painting and pottery work are highly prized by visitors. Art $10 and up 19th century local scenes art and photo prints start around $10. Original historical photos and royalty pictures start around $100. Qajar style paintings go well into the 100s. Antiques $15 and up 19th century maps and manuscripts start around $15. Vintage Copper pottery, hookah pipes, etc start around $100. Persian Wool Rugs start well in the 100s and go into the 1000s. Collectibles $30 and up Royal Air Force Badges and other patches start around $30. Vintage Shah curios such as medals start into the 50s. Semi-precious mineral cluster samples, original empress photos, Isfahan Handmade Enamel Plates, Military Orders, etc go well into the 100s and 1000s.